Seattle Parks and Recreation is starting a planning process to address future directions for the parks system. A draft of the Parks Legacy Plan was released for comment on April 8. Public outreach meetings will be held starting in May, with the second draft of the plan due to be completed in June. A new map details the locations of collisions involving pedestrians and bicyclists between 2007 through most of last month. Users of the map can zoom into an area and sort by type of collision or year. The Cross Kirkland Corridor project was halted on April 1, after the City of Kirkland was served with a Federal lawsuit seeking to stop the city from removing the rail tracks. Link light rail trains now run every 20 minutes after 9 pm on weeknights rather than every 10 minutes while workers install a new sound wall. The work should be completed by the end of July. Police officers in Fort Lee, New Jersey held a four-hour decoy operation to determine whether drivers would yield to pedestrians in crosswalks. Those drivers who failed to yield, 56 total, were given summonses, though many of the drivers were quick to share excuses for their behavior. 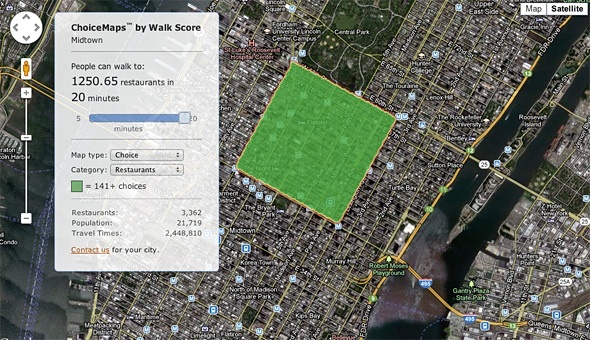 Walk Score released ChoiceMaps, a way to measure access and choice in neighborhoods. ChoiceMaps shows the depth of choice, such as the number of walkable restaurants within a specific neighborhood. America Walks has two upcoming free webinars. On April 16, the webinar “Taking Action on the Proposed Call to Action on Walking” will take place from 11:00 am – 12:00 pm. This webinar will focus on the Surgeon General’s call to shape walking in America. Another webinar, “Leadership at the Top: Working with State and Local Officials to Prioritize Walking into Transportation Planning,” will take place Friday, April 26 from 11:00 am to 12:00 pm. A recent study found that walking is as effective as running for lowering risk factors for heart disease. The catch? A walker needs to expend the same amount of energy as a runner, which requires walking at a moderate pace for the same distance. Americans have actually been driving less since 2005, making the need for investment in public transportation and pedestrian and bicycle infrastructure even more necessary in recent years. The best Complete Street policies of 2012 were released earlier this week. 125 communities adopted Complete Street policies last year, bringing the total number of policies to 488 nationwide. Ocean Shores, WA made the top ten list for exceptional work in 2012. Interested in what other areas are doing? Take a moment to read Minnesota’s Complete Street Toolkit. Chicago shared their Complete Street Design Guidelines, announcing that for every new project, including minor roadside work, the pedestrian comes first. The downtown area of Yangon, Myanmar is slowly being replaced with parking spots. An area previously lined with sidewalk cafes was reduced by nearly two-thirds, forcing many street vendors to close up shop. Walk Friendly Ontario showcases five communities who are participating in the WALK Friendly pilot program. Read about their accomplishments so far, such as one local initiative called Walk to Shop, for which the city provides funds to neighborhood shopping districts to increase foot traffic to their businesses. Violent crime on Berlin’s public transportation dropped by nearly one-fifth in 2012, from 3,183 to 3,897 violent crimes committed on buses, U-Bahn trains, trams, and train stations. Montreal launched a pedestrian safety campaign to make dangerous intersections safer by synchronizing lights or by creating pedestrian stopping points halfway through large intersections. Photo courtesy of Walk Score.